I had written the letters ‘LCBO’ maybe twenty times on this site when I realized – if you’re a visitor form outside Ontario, you’re not going to know what this is. 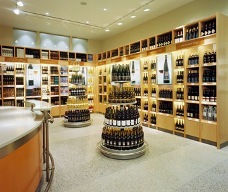 The LCBO is the largest purchaser of alcohol in North America. The LCBO used to be this warehouse type place where you picked up a form, checked the appropriate boxes indicating the products you wanted to buy, and some guy would go in the back and bring your liquor or wine out for you. There was something about the place that just told you that yes, you were indeed in the process of sinning. (I’m just joking about sinning.) But a lot has changed. Today they have all the bottles out there for your viewing, you select you own stuff, they sell wine, liquor, and beer, staff are around for help, there are lots of information and promotional materials, and most of all if you come in on a particularly magical day there may be free samples! I love the LCBO more than I like wine, liquor or spirits. Even more than I like beer!